Once upon a time while travelling the three worlds, Yogiraj Narad Muni reached Martya lok (Planet Earth), he saw the human beings suffering immensely. 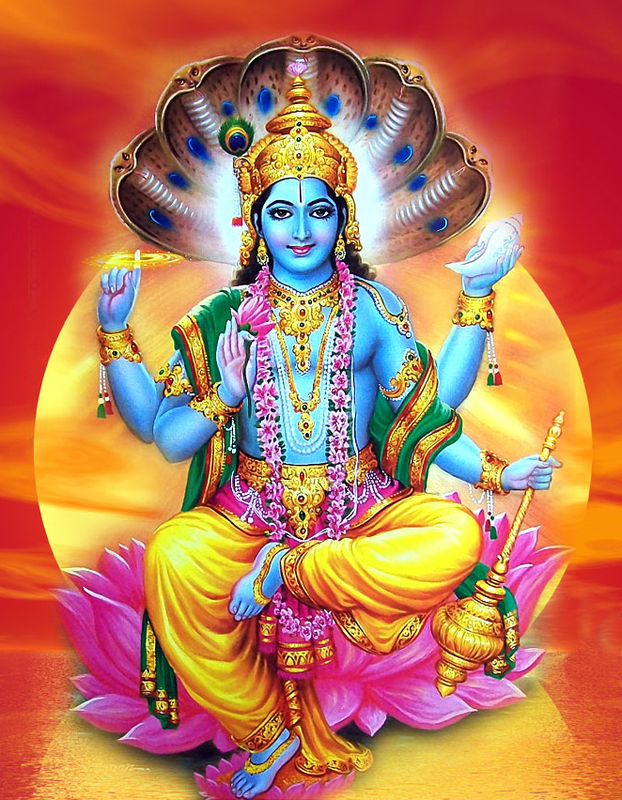 He visited the abode of Lord Vishnu, who alone can relieve the mankind from the sufferings. To free man-kind from all sufferings, & to ultimately reach Heaven, there is one virt (fast), & today I will tell you all about it. Anyone who does Shri Satyanarayan’s Virt & Puja (prayer) in the right way; will get all the pleasures on earth & will reach his goal. Whosoever does Bhagwan Shri Satyanarayanji’s Katha with Brahmin & with his family with full rites will be relieved of his sufferings & sorrows, will be bestowed with increase in wealth & wisdom; will be blessed with children; get overall victory & increased devotion. For this prayer, one requires riped bananas, ghee, milk & choori (made with wheat flour, ghee & sugar). After the prayers, all present must have the prasad & then take their meals together, & then sing, praise, & chant mantras of Lord Satyanarayan. By doing this, their wishes will be fulfilled. This vrit in kaliyug gives the boon (reward) very quickly. This chapter of Shri Satyanarayan Swami is over. All chant (say) Shri Satyanarayanji Ki Jai. After telling him all the details of the prayer & the fast; the old Brahmin i.e. the Lord disappeared. The brahmin could not sleep that night. He kept thinking of the fast & the prayer which the Lord had asked him to do. In the morning, he woke up with the thought that anyhow he must do the prayer & went out for his bhiksha. On that day the Brahmin got a lot of money from which he bought all the necessary things for the prayer; called his family & did Lord Satyanarayanji’s prayer. By doing so, the Brahmin overcame all his sorrows & became rich. From that time onwards, he used to do the prayers every month without fail. In this way, whoever does Lord Satyanarayanji’s prayer will get moksha. Anyone on earth who does this prayer will be relieved from all sorrows. The same Brahmin now a rich person used to do the prayer every month without fail with his family. Once he was doing his prayer, a wood-cutter passed from there. After keeping the bundle of wood outside the brahmin’s house, he went in for some water. The thirsty wood-cutter saw the brahmin doing his prayers. He bowed down to the Brahmin & asked him, “Oh Brahmin, what are you doing, please tell me all about it.” The Brahmin replied, “To grant all the wishes of human-beings, this fast & prayer is useful. I have acquired all the wealth & fame by doing this prayer of Lord Satyanarayanji.” After hearing about the prayer & drinking the water, the wood-cutter felt happy, he ate the prasad & left for his house. Thinking of Lord Satyanarayanji in his mind, he said “Whatever today, I get from selling the wood, I will also do this prayer.” So thinking, he kept the bundle of wood on his head & left home-wards. On the way home he went roaming in Sunder Nagar for selling the wood. On that day, he got four times more money than usual, for the wood. Feeling happy, he went & bought all the things necessary for the prayers (i.e. ripe bananas, sugar, ghee, wheat flour, etc.) & proceeded home-wards. On reaching his house & after cleaning it, he called his family & did the prayer with due respect. This chapter of Lord Satyanarayan Swami is over. All chant (say) Shri Satyanarayanji ki Jai. One day, with the grace of Lord Satyanarayanji his wife became pregnant. In ten months’ time, she gave birth to a beautiful daughter. They named her Kalawati. Days passed by; one day, Leelawati slowly & sweetly reminded her husband about the prayer & fast & requested him to fulfil his promise. The merchant told his wife that during the time of Kalawati’s wedding it would be easy to observe the same; for at the moment he was busy in his business; so saying he left for his business trip to various villages. Kalawati grew up to be a beautiful girl. When the merchant saw that his daughter was of marriageable age; he called the match-maker & requested him to search an equal match for his daughter. Hearing the merchant’s request, the match-maker reached Kanchan Nagar. From there, he brought the proposal of a young handsome boy. One day, the thieves robbed the wealth of the king & they went & stayed where the merchant was staying. Seeing the guards following them, they left all the loot over there (where the merchant was staying), & hid themselves. When the guards reached the merchant’s place, they saw all the king’s wealth. Thinking them to be robbers, they hand-cuffed the merchant & his son-in-law & took them to the king & told him that they were responsible for the theft. The king, without questioning or listening to them ordered to put them in a dark cell. Due to Lord Satyanarayanji’s maya, nobody heard them. Even their wealth was confiscated by the king. At the merchant’s house, the thieves robbed all their wealth & his wife & daughter had to beg for their daily bread. One day, begging for food, Kalawati reached a Brahmin’s house where at that time Lord Satyanarayanji’s puja was going on. After listening to the prayer & taking the prasad, she left for home. By that time, it had become dark. Leelawati was worried. She asked her daughter Kalawati, why are you so late? To which Kalawati told her mother, “Oh Mother, today in a Brahmin’s house, I heard a prayer. By doing this prayer & fast, all your wishes get fulfilled.” On hearing this, Leelawati started doing all the preparations for the prayer of Lord Satyanarayanji. She did the fast & prayer & asked the Lord for forgiveness & prayed that her husband & her son-in-law should return home safely. Lord Satyanarayanji was pleased with the prayer & the fast. One day, he told King Chandraketu in his dream, “Oh King, You must release the merchant & his son-in-law from the dark cell, tomorrow morning. Give them their wealth & set them free. If you do not do so, your kingdom will be destroyed.” In the morning, the king called the court people & told them about the dream. The court people after hearing about the dream, came to the conclusion to free the merchant & his son-in-law. They asked the guards to bring the prisoners from the dark cell. King Chandraketu gave them good clothes, all their wealth & plus some more & set them free. The king told them that due to their wrong-doings, they had to undergo this suffering, but now there was nothing to fear & they could go back home. They bowed down to the king & left home-wards. This chapter of Lord Satyanarayanji is over. All chant (say) Shri Satyanarayanji ki Jai. Suta ji said, “The merchant prayed first & then gave some wealth to the Brahmin before starting his journey home-wards. When they went little further, Lord Satyanarayanji wanted to test them. He took the disguise of an old man & went up to the merchant & asked him, “What is in your boat, give me little from there.” In his ego & pride, the merchant replied, “Oh Old man, we have nothing in our boat except hay & leaves.” On hearing such harsh words of the merchant, the Lord said, “Your words will be true”. So saying, he went from there & sat on the bank of the river. When the Lord went away, the boat started to rise higher in the water. The merchant was surprised at this. When he went to check in the boat, he saw that his boat was filled with leaves & hay only. Seeing this he fainted. When he came to his senses, he was very much worried. He said “How could this happen?” At this, his son-in-law told him, “Do not cry over this. All has happened because you spoke harshly to the old man & lied to him. Still, nothing is lost. You could go back to him & ask for forgiveness & he will set everything right. 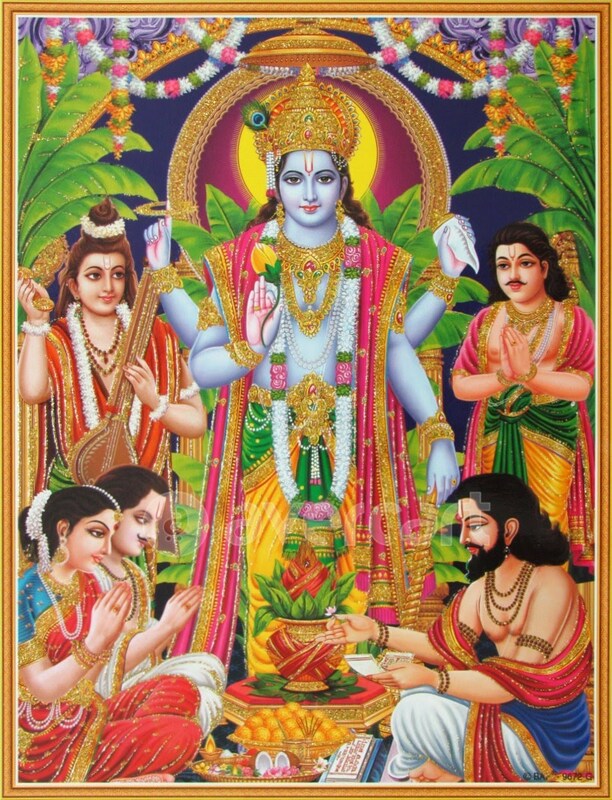 On hearing the merchant’s words filled with bhakti, the Lord was happy & he fulfilled his wish. When the merchant mounted his boat & saw it full with wealth again, he thanked the Lord & said, “With Lord Satyanarayanji’s grace, my wish is fulfilled. When I reach home, I will do his prayer & fast”, so saying he left home-wards. When the merchant saw that his home-town Ratanpur is nearing, he sent a messenger in advance, to his house to inform his wife & daughter of his home-coming. The messenger, on reaching the merchant’s house, bowed down to the merchant’s wife & gave them the most awaited news that the merchant & his son-in-law have reached Ratanpur. Leelawati had just finished doing her Satyanarayan Puja. She told her daughter to finish doing the prayer & then come & receive her husband & her father. Kalawati finished doing her quickly & without taking the prasad left to meet her husband. The Lord got angry at her behavior, so he drowned her husband with the boat. When Kalawati did not see her husband; she was shocked & she fainted on the floor. On seeing his daughter in this state of affairs & the sudden disappearance of the boat, the merchant was shocked. He prayed to Lord Satyanarayanji, asked him for forgiveness & prayed to the Lord to take them out of this difficulty. The Lord then made an announcement, “Oh merchant, your daughter, in a hurry to meet her husband has left my prasad; hence you cannot see her husband. Now, when she goes back & takes the prasad with due respect & then returns; only then she will see her husband.” On hearing the voice, Kalawati ran home, ate the prasad & came back & met her husband. When the merchant saw this, he was very happy. 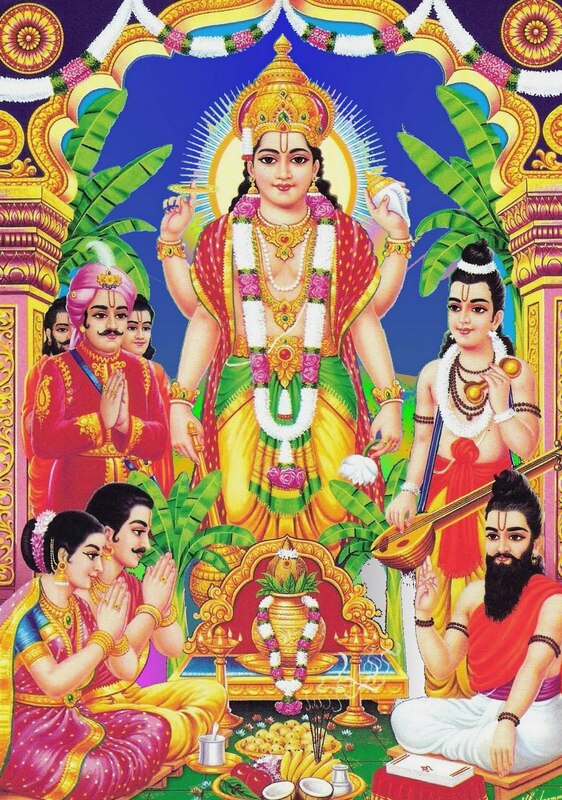 The merchant then did Lord Satyanarayanji’s prayers & fast with his family every month. Finally, he had all the pleasures of life & after death, he went to heaven. This chapter of Lord Satyanarayanji is over. All chant (say) Lord Satyanarayanji ki Jai. When the King reached his Kingdom, he saw that everything was destroyed & all his 100 sons were lying dead on the floor. The King realized that this had happened all due to his false ego. So thinking, he started walking towards the place where the villagers were doing their prayers. There, with them, he did the prayers of Lord Satyanarayanji & had the prasad & the charna-amrit (i.e. 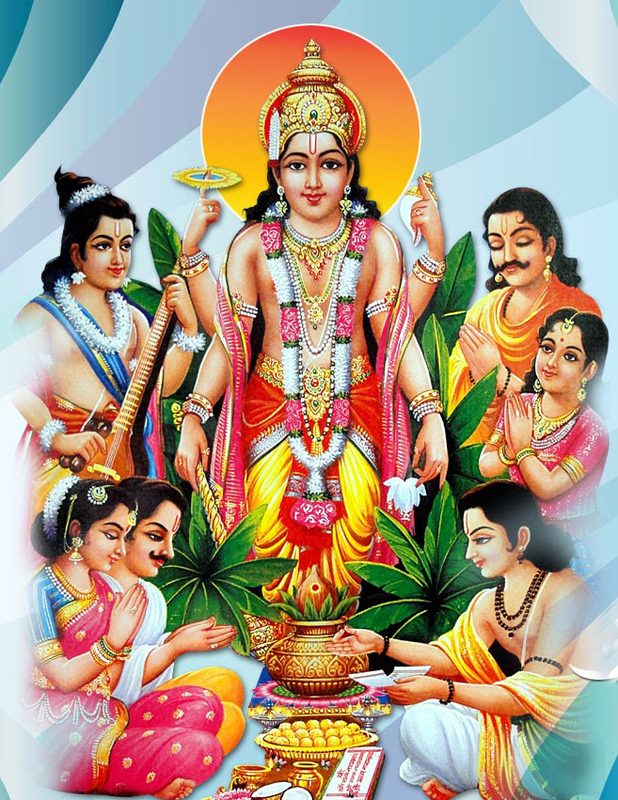 milk, sugar, curds, tulsi leaves & honey mixed together) & put it in all his son’s mouths. By doing this, all his sons became alright. He got back all his wealth & comforts of life & finally in the end, after he died, he went to heaven. Anybody who keeps this fast with full faith & recite the prayers of Lord Satyanarayanji; all his wishes will be fulfilled. With the grace of the Lord, he will get eternity; the wealth less will receive wealth; & will go to heaven & finally will come out of the circle of birth & death. The names of the persons who kept this fast & took re-birth are as follows: – The Brahmin took birth as Sudama & in his entire life he served the Lord Krishna & attained moksha. King Ulkamuk took birth as King Dashrath, & in that life he became the father of Lard Rama & attained eternity. The merchant took birth as King Morad, who cut his son in half & offered to the Lord & got moksha. King Tunghdwaj took birth as Kewat, who took Lord Rama across the river, served him & got moksha.